Now I consider myself to be pretty knowledgeable in the coffee and tea beverage area. I won't mention the name of the restaurant that I was a Training Manager at but I had to be quite savvy in the beverage department. I prepared gourmet coffee beverages, Italian sodas, and dessert beverages daily. After leaving this company I still have the taste for the same drinks (without of course the cost). I hate going to places like Starbucks or the Coffee Beanery everyday to get a yummy snack. The costs are ridiculous! So what do I do? I create them at home like everyone else is forced to do (especially to save money). I am by all means not a coffee addict like some who need it to function, however, having the Keurig makes it easy to make something different each day! 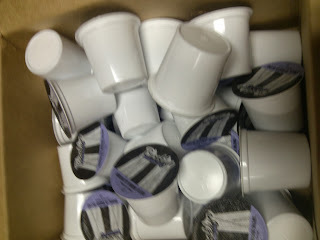 So when Brooklyn Bean Roastery asked me to review one of the coffee K-Cups, I was all about it! 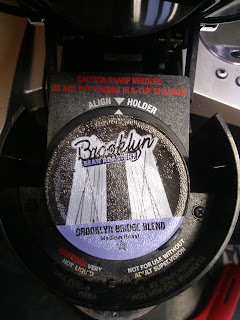 The sent me over a box of their Brooklyn Bridge Blend. "A medium roast that combines four varieties of coffee, this blend brings together juicy, berry flavors with lighter citrus notes, all combined with a rich, smooth base to produce a cup that will delight your palette and remind you what you love about coffee." Now Kevin was the first to try this one and his first reaction was this was a weaker and bland roast. However, I could have told you this would be the case since he prefers his coffee black and strong! I on the other hand love my foo foo coffees so I was pleasantly happy with this roast and the flavor pop I felt it brought! Recommendation: Seems expensive especially if you drink coffee like a fiend however, its worth the cost if you enjoy savoring a cup just the way you like it. Giveaway: Brooklyn Bean Roastery is going to give one of A Lucky Ladybug's lucky readers the same set of beauty products of their own! Be sure to visit the other blogs in the linky below the giveaway form for a chance to enter to win a ton more coffee! This event is hosted by The Review Wire and Review Wire Media and is dedicated to all coffee lovers! 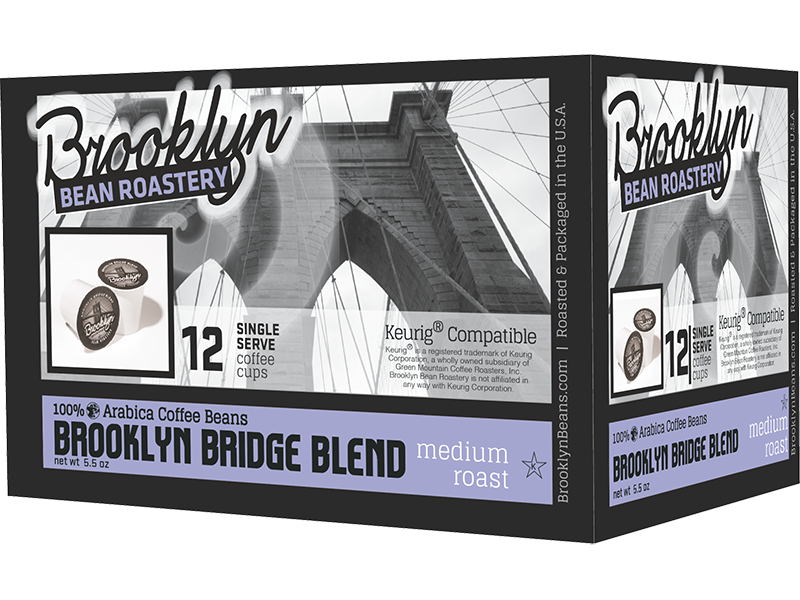 All participating blogs are offering a 40 count box of Brooklyn Bean Roastery k-cups, each blog a different flavor! Grab your favorite cup of joe, sit back and stop by all the blogs where you can read up on all the different Brooklyn Bean Roastery coffee flavors...you may discover something new. Disclaimer: This giveaway ends at 11:59 PM EST on November 19, 2013. The Brooklyn bean Roastery Event Bloggers are not responsible for shipment of the prizes. I was provided with product for this review. All views and opinions with regard to Brooklyn Bean Roastery or the company are my own and were not influenced by the company. I would really like to try Maple Sleigh. I would really like to try the flavored coffee like the Vanilla Skyline or the Hazelnut. I would love to try the Coney Island Caramel. I'd love to try Vanilla Skyline! I would also like to try the Cinnamon Subway flavor. I really want to try the Corner Doughnut Shop. Id also love to try the Cinnamon! I would like to try Coney Island Caramel. I would love to try the Cyclone. I would like to try Brooklyn Bridge Blend. I would like to try my favorite flavor, Hazelnut. I would love to try the Cocoa flavor! Thanks for the giveaway! I love all the giveaways you do! Keep up the great work! I would like to try Fuhgeddaboutit. I would love to try the Cinnamon Subway!! I would love to try the Cyclone one!! I'd also like to try the Corner Donut Shop. I would love to try the Fuhgeddaboutit! Sounds like something the dark roast people in our house will love! I would love to try Maple Sleigh and Fugeddaboutit . My husband loves really strong coffee so bet he would enjoy that one. I'm drooling over Oh Fudge! Flavor. I would love to try the Corner Doughnut Shop but then again I love to experiment with new things and this would sure be the time to do it. I want to try the Cinnamon Subway flavor! I thing I would like to try Colombian blend. I'd love to try the Coney Island Carmel and the Vanilla Skyline,,,these sound perfect. I want to try the Oh Fudge! I love that you have the links for social media following all on your page but it would be easier to find if it was all the way at the top left or right. I want to try the Vanilla Skyline! I'd love to try the Oh Fudge! flavor! I'd like to try the Fuhgeddaboutit dark roast. Sounds good, and has a fun name! i would love to try the corner donut shop flavor by brooklyn bean roastery, thank you! I would love to try coney island caramel and oh fudge! I'd like to try Coney Island Caramel. I would love to try the Oh Fudge! I would try the Breakfast Blend. I'd like to try Oh Fudge. I would like to try the hazelnut flavor. I'd really love to try the Maple Sleigh k-cups! I would love to try the Coney Island Carmel. the coney island caramel or oh! fudge. I would love to try the maple sleigh flavor! I would love to try the hazlenut. I'd like to try the Boardwalk Blend. I want to try the Corner Donut Shop. I would like to try Oh fudge. I would really like to try Cinnamon Subway. I really like your blog because its easy to navigate and I love entering the giveaways. thank you! I really want to try cinnamon subway. I want to try the Fuhgeddaboutit.